Accidentally in Love with...A God? (Accidentally Yours, #1) - "A Single Word ... "
This book came to me via NetGallery in exchange of my honest opinion & review. So the following is just my thoughts and have no reflection on anyone associated with the book. What does snarky humour,witty banter,frustrated but interesting characters and a jaw-dropping cliffhanger equal to? 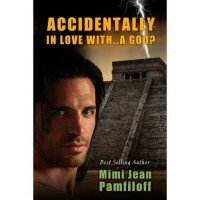 To me it's this 1st book in Mimi Jean Pamfiloff's "Accidental Yours" series. I enjoyed the book and looking forward to reading more from this author. I gave it 4 stars out 5.